Cháo cá (Vietnamese for fish congee) is Aria's favorite dish these days. At one and a half years old now, she's able to eat pretty much anything and everything. But don't be fooled by its appearance; rice congee isn't only meant for babies. Cháo is a very popular meal in Asia; I personally love it too. 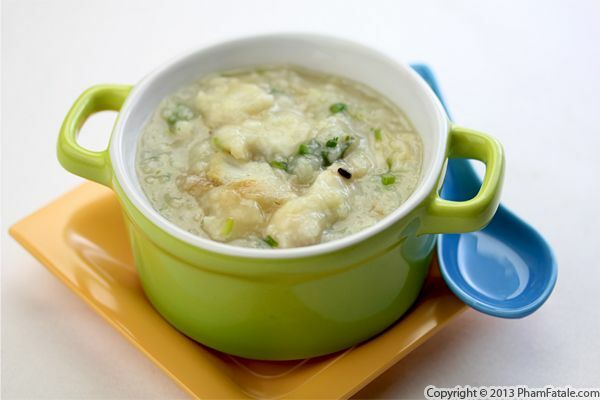 In this version of congee I cook rice in fish stock until it becomes a thickened soup. I like to make small portions at a time by adding thinly sliced white flaky fish, ginger, onions and cilantro at the last minute. The key to flavorful fish congee is to use the freshest products available. It's been windy and cloudy in the Bay Area and we just changed all the comforters and blankets, so everyone is comfy and cozy in their beds. Having hearty, warm meals helps out a lot during the rest of the day, and being Vietnamese, I can’t think of anything heartier than soup. Soup is probably the quintessential comfort food in Vietnamese cuisine. I’ve made many types in the past, and today I created a Vietnamese egg noodle soup with seafood, called mì đồ biển. 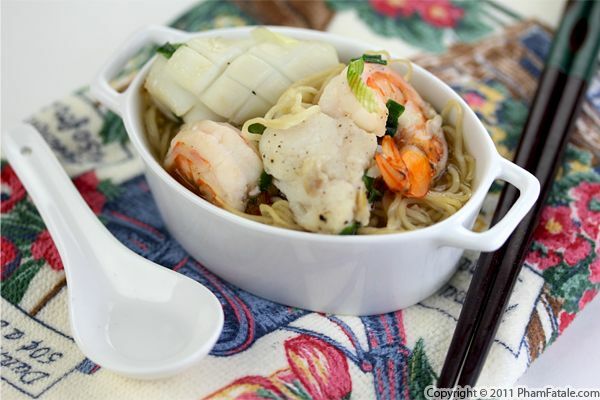 The soup consists of flavorful fish stock with fresh egg noodles, shrimp, quail eggs, baby squid and halibut (or any white fish). It is completed with Chinese chives (called hẹ in Vietnamese) and green onions. The weather is getting cold and damp, so I thought a cioppino-style soup was a good solution to fight the low temperatures we've been having. I didn't really make the authentic San Franciscan fish stew, nor the traditional Provençal version of bouillabaisse, but a more Asian adaptation of the seafood soup using ingredients I recently received from our friends at AsianFoodGrocer.com. 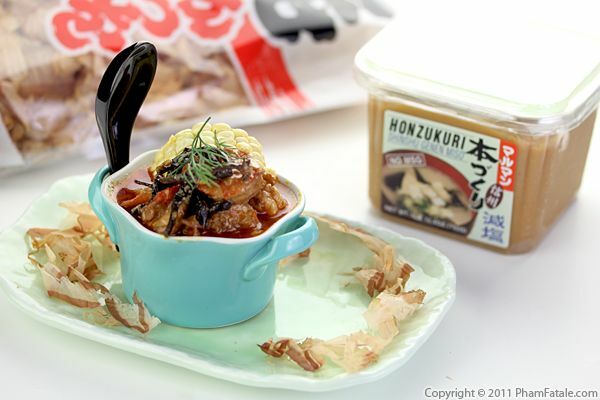 The major change is that I made the broth using bonito flakes, Asian mushrooms and miso paste. Otherwise, the seafood soup is cooked with the more common ingredients such as fresh tomatoes, corn, fish and shellfish and flavored with fennel, mushrooms, garlic, lime peel, dill and saffron. I also cracked one separately cooked Dungeness crab and gathered the meat at the last minute to add to the bass fillets, mussels, clams and small shrimp already cooking in the soup. I served it just the way I would bouillabaisse (the Southern-French stew originated in Marseille) with garlic bread and rouille sauce, which is a saffron-flavored mayonnaise. To bouillabaisse purists, the addition of bonito flakes and miso paste may seem sacrilegious, but I think it was a refreshing twist with an Asian flair. If you’re considering making this dish, I have some good news: our friend Gustavo from AsianFoodGrocer.com is kindly giving away a $50 gift card that you can win this week on Pham Fatale! The deadline is Sunday, October 16th, 2011. And for those of you who can't wait to try AsianFoodGrocer.com products, head over to their online store, enter coupon code PHAMFATALE during checkout (exclusively for Pham Fatale readers) and get 10% off your entire order; the coupon expires on October 22nd, 2011 so make the most of it!